When planning a ventilation system for livestock buildings and barns, you’ll want equipment that’s both efficient and effective. Since the health and wellness of your animals is at risk, any responsible business owner will want to take proper ventilation seriously. 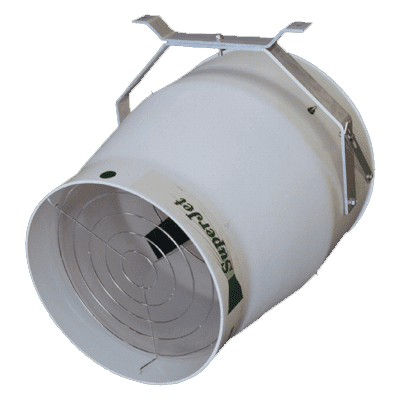 Industrial ceiling fans have been a staple in livestock ventilation systems for decades, but you may be able to save some capital by investing in newer, more effective technologies! Ceiling fans, also known as “casablanca” fans, are multi–directional in airflow from the propeller blades. This means that the airflow is sideways and down from the propeller at an angle and there is little air flow directly under the center of the fan. Due to the small amount of air volume produced and the lower velocity of the air stream, very little induction (mixing) of the room air results. This low velocity of air from the propeller soon loses its carrying velocity, resulting in a small air throw pattern. Therefore, multiple ceiling fans will be required for a system and the energy cost of operating this type of air circulation will be high in comparison to alternatives. Most industrial ceiling fan motors are 2 or 3 speed, in lieu of being variable, and the speeds are manually selected. Most ceiling fan motors are not totally enclosed, are not watertight, do not have ball bearings on both ends of shaft for longevity of the motor, do not have automatic thermal overload features, are not corrosion resistant, do not have air–over cooling design and in general are not suited for total confinement use. Some motors are “air-cooled”, employing a small propeller to drive the air past the motor to cool it. Being exposed to the confinement building’s elements, these tiny propeller blades soon become clogged with dust, dirt and hair and lose their cooling power. Osborne’s Super-Jet fans are specially designed to be more efficient and effective than traditional ceiling fans. The Super-Jets were designed to take advantage of the coanda effect of airflow near a ceiling or wall. This ability of large volumes of discharge air (even low temperature air) to attach to the ceiling and flow along that ceiling for a longer length is dependent on the discharge velocity. The high discharge velocity of the issuing air from the Super-Jets (due to the design of the housing) results in a longer air throw and therefore less fans are required. Even at low speeds the airflow is held at the ceiling longer and allows the incoming air and the room air to mix for a longer period of time before the air stream reaches the occupants, without drafts. Temperature stratification, pockets of stagnant air, as well as cold, hot or wet areas are all eliminated. With no cold drafts and maintaining an even temperature throughout the pens, the dunging patterns of the occupants is vastly improved.